Dog Ear Publishing reviews a new book starring a courageous young woman who survived cancer and is working to help her grandmother in her own battle. Dog Ear Publishing releases “Half My Life” by Melissa Novak. 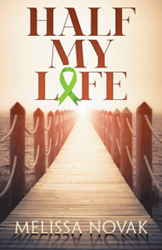 The author’s own fight against cancer adds a note of authenticity to the novel. (PRWEB) July 22, 2015 -- Waiting in a hospital is nothing new for Abrielle, a young woman who beat lymphoma three years before and watched her mother lose a cancer battle of her own. This new novel from Dog Ear Publishing focuses on a new cancer victim – her grandmother, who has been diagnosed with stage III lung cancer. This latest setback forces Abrielle to draw on all her inner strength, as cancer once again takes center stage in her life. Abrielle also must face facts in her own life: Her longtime crush and best friend Quin is dating someone else, although he vows to support her now. And she’s drawn to Jace, the handsome young guy who manages the homeless shelter where she works, who happens to be her grandmother’s neighbor. Abrielle, well-versed in martial arts and guns, handles security at the shelter as one of her many jobs there. During an overnight shift she comes face-to-face with burglars but later helps apprehend one of the culprits. She transfers to a homeless shelter closer to her grandmother’s house, so she can help as treatments begin. That’s not the only change that happens in her life because she helps a young girl with lymphoma and begins a romance with Jace. All is not well, however. She discovers Jace has secrets and her grandmother’s treatment isn’t helping. A shocking encounter with a jealous woman has the potential to change everything. “Half My Life” leads readers on an adventure of the heart, and Abrielle must decide if she can risk it all for the man who has the courage to follow her journey. The author’s own fight against cancer adds a note of authenticity to the novel. Author Melissa Novak was raised in Chicago. She was diagnosed with stage I non-Hodgkins lymphoma not long after getting married but beat the cancer within six months. Novak has been in remission since May 2012. Dog Ear Publishing offers completely customized self-publishing services for independent authors. We provide cost-effective, fast, and highly profitable services to publish and distribute independently published books. Our book publishing and distribution services reach worldwide. Dog Ear authors retain all rights and complete creative control throughout the entire self-publishing process. Dog Ear Publishing reviews services and other book marketing services are available to connect great content with interested readers. Self-publishing services are available globally at http://www.dogearpublishing.net and from our offices in Indianapolis.